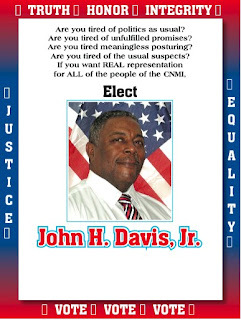 Here is a letter from John Davis who is running for the position of US Congress delegate for the CNMI. As you probably already know, I am running for the seat of CNMI Delegate to the U.S. Congress. However, you probably don’t know much about me. And since I am not as well known as some of the other candidates I thought I’d better start catching up in the “who I am” department. Until recently I was very actively involved in sports. I have competed in football, wrestling, boxing, and track. I have competed internationally in track and boxing. I represented the CNMI in bodybuilding and weightlifting. I have been a sport parachutist, and taikwondo “breaking” demonstrator, and I have skied the Alpspitz (a mountain in Germany) from top to bottom. I retired from the U.S. Army after twenty years of service. I earned the Combat Medic’s Badge and Bronze Star with “V’ Device while serving one and a half tours with the 101st Airborne Division in Vietnam from 1966 to 1968. I have earned All-American status on two separate occasions as a member of the Veterans of Foreign Wars Saipan Post 3457. My children are all adults and, except for my youngest, live in the mainland United States. I raised three children here in the Commonwealth. My baby is now a sophomore at Northern Marianas College. My family ties within the Commonwealth are limited. I am not a member of any political party or political organization. I live in the CNMI because I like it here (the sun, the ocean, the beaches, the laid-back lifestyle that sometimes is laid-back a little too much). I don’t owe money or favors to anyone. I speak my mind and sometimes from my heart. I have a Master’s degree in Education and I teach Advanced Placement Language Arts (English) and Advanced Placement Government and Politics at Marianas High school. Two years is a very short time to claim that I am going to move the earth. So aside from my pledge to faithfully represent all of the people of the CNMI with truth, honesty, and integrity, I will also promise not to use the office to maximize my photo opportunities, not to use the office to maximize my time on the golf courses, not use the office to assault my subordinates, and not to use the office to line my own or my family’s pockets. (1) Introduce legislation for the transfer of the control of the Exclusive Economic Zone (EEZ) and submerged lands surrounding the CNMI from the United States to the CNMI. (2) Immediately introduce legislation to have an office of the Small Business Administration open in the CNMI. (3) Immediately introduce legislation to have a Veterans Administration Hospital built in the CNMI. (4) And, if it is still an issue, work to have green cards and/or passports granted to non-American individuals who have immediate relative status in the CNMI. I think that getting these issues resolved will be a full time endeavor. If anyone is promising more, he is either lying, has no concept of the nature of the office, or he is a superhero. Well, that’s me, John H. Davis, Jr. in a very small nutshell. But, at least you have an idea of who I am. I will be happy to meet with anyone or any group to elaborate on my positions. If you are inclined to hear more, please contact Jeanne Rayphand at 235-9115, 235-5123 or 287-9807 and she will set a time and date. Thank you for your time and no matter for whom you vote, please VOTE. So far removed from the lush brown dirt of the Mississippi Delta where I dug bait worms for my grandmother. Coral sand pillowing my feet instead of the cool Mississippi soil of my great aunt's garden. So far away yet so close to home. Perhaps Saipan is the closest answer to the pondering of "What if black folks ran things." An experiment that african americans will never be able to conduct. So....things are slow here and many folks don't know what to call people who look "black". I had to really think what I should call my self out here. How could I describe myself accurately to someone who didn't really have a concept of what "black" means. Sometimes when I said "Black" they still looked at me curiously. "Black" to a Russian, Japanese, Korean, or Chinese person really didn't mean much. So I started calling myself a "Black American" Because...afterall...Black IS Black and nothing is any cooler or more aesthetically pleasing than that. And American because God knows I can't escape it. I am uniquely American and can finally accept it. Locals (people of island decent) would often stumble a bit when trying to say that they knew "Black" people back in the states. They'd stammer and look at me apologetically and say "I knew someone like you." The truly didn't know what to call me and didn't want to offend. It made me smile. Here I can be "Black" and also be in peace. Despite the fact that people often had no idea what to call me, they welcomed me. I not been any place on the islands here and not felt welcome. It's the familiar smell of food cooking, cold drinks and feel of Southern Hospitalty. MMMmmmm. Mentally and physically it is as if a cage has been lifted. Racism in the states is like cholesterol. It's in you dragging you down, influencing every aspect of your well-being but you don't actually realize what it's doing. How sick it makes you. I feel it whenever I go back to visit. And am grateful every time the plane lands on saipan and that hot blast of island air hits my lungs. Yeah...paradise is what you make it. And in some of the least likely places. On my recent trip to Guam, I got a nice little surprise. 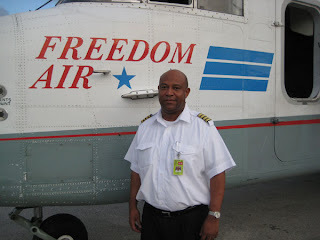 Turns out the chief pilot of Freedom Air, a micronesian provider that flies to Guam is none other than a Jamaican! Meet Cardiff Walker, I and I new bredrin from Yaad! On May 7, 2008, the Northern Mariana Islands Council for the Humanities with support from the African American Cultural Preservation Committee hosted a unique event. Bill Grimmette was invited to the island of Saipan to take us on a journey back and forwards in time. Bill does performances around the world in the character of Martin Luther King, Jr.
Having Bill do such a performance along with the requisite audience question and answer participation, allows us to speculate and participate in discussions that might be taking place had Martin Luther King, Jr. been alive today. Here are a few photos from the evening's event. The CNMI African American Cultural Preservation Committee is a non-profit organization dedicated to enhancing the experience and promoting the awareness of the African American community within the CNMI and the entire Pacific region. In addition to community support and scholarships, we offer educational programs, workshops and lectures on topics and issues including Indigenous Cultural issues, African American Culture and History, African Influence in the Pacific Region, and Mixed Parentage Challenges among other issues. As a vibrant community within the CNMI, our members have traditionally offered our time, talents and passion to the growth, development and prosperity of the CNMI. Through programs, press-releases and our website, we shall continue to increase the overall community's awareness of our presence, history and contributions. We shall ensure that communities within and visitors to these islands are aware of the unique African and African American contribution to world and regional history. We shall promote the cultural legacy of people and cultures of distinction. Our annual Dr. Martin Luther King, Jr. Commemoration March and keynote speech is an example of this promotion. Our community's support and persistence (along with local legislators) was instrumental in the passage of legislation to recognize MLK Day as a commonwealth-wide holiday. The CNMI African American Cultural Preservation Committee is a cohesive community of and for people and families of African descent here on the Mariana Islands (Saipan, Tinian, Rota). Our welcoming committee offers information and a wealth of experience and perspectives to new arrivals to the CNMI to assist in any needed adjustments and transition. We shall promote fellowship and camaraderie among all who have chosen to live here in the CNMI. We shall meet regularly, organize events that allow members to interact, improve life and to get to know one another personally. We welcome all regardless of nationality, culture or background. 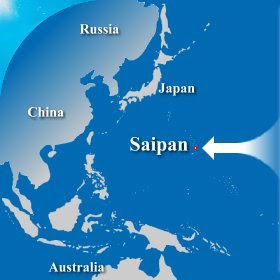 When we say "Blacks" (with a capital "B") on Saipan, we're not referring to a color so much as a diverse cultural identity. Because of the unique history of Blacks throughout the world as a result of forced and voluntary migration from the African continent, many Blacks now identify culturally and ethnically with countries and regions other than the motherland. As a result of the identity-robbing effects of slavery, many Blacks can no longer trace their origins to any specific country in Africa. As a result, when people within the transplanted Black community worldwide refer to themselves as "Black," it is with the tacit understanding that it is more than just a color, but a nod to an often-times lost African cultural origin, diluted as it may be through years of migration and mixing. Therefore, when you see someone who appears "Black" on Saipan, they may well be from one of any number of countries on the African continent--Ghana, Kenya--the Caribbean-- Jamaica, Trinidad, Barbados--South America (Brazil) or the US mainland.